Mag Mix — Adds depth and thickens Akua Intaglio ink. Clear/white in color with a very stiff consistency, it cleans up with liquid dish soap followed by water. Blending Medium — For use with Akua Liquid Pigments or Akua Intaglio inks. Use blending medium to thin the ink for brushwork, wash effects or use as a resist for viscosity monotype. This clear liquid cleans up with water. Retarder — Retarder serves two purposes: it acts as a release agent for printing on dry paper and retards the Akua Liquid Pigments from drying on the monotype plate, therefore extending the working time. Use with Akua Liquid Pigments only (not necessary with Akua Intaglio inks). This clear liquid retarder cleans up easily with water. Tack Thickener — This modifier thickens and deepens Akua Liquid Pigments colors. It can be used for creating denser Akua Liquid Pigment roll-ups onto monotype plates. It has a thick consistency, medium amber color, and cleans up with soapy water. Carborundum Gel for Platemaking — This ready-to-use platemaking gel delivers fine, sharp detail and a uniquely textured surface that yields rich, velvety areas of color. Use this consistent, reliable medium to create collagraph printmaking plates. It's great with Akua Intaglio Inks and works in a range of applications for many creative possibilities. Transparent Base — Transparent Base is Akua Intaglio ink without the pigment. 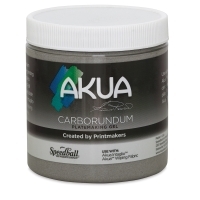 It can be used with both Akua Liquid Pigments and Akua Intaglio inks. Adding Akua Liquid Pigments to Transparent Base will thicken the Liquid Pigments and create new intaglio or relief colors. When added to Intaglio ink, this base will increase the ink's transparency. It has a thick consistency and light amber color, and cleans up with liquid dish soap followed by water. Extender — Use Extender to thin Akua Liquid Pigments only (not recommended for Akua Intaglio inks). Medium amber in color, Extender has a liquid consistency and cleans up easily with water. These modifiers are for use with Akua Intaglio and Akua Kolor Waterbased inks. The modifiers offer a variety of options for various printing processes - and all are eco-friendly and non-toxic.